The Multidisciplinary Breast Cancer Treatment Team at the University of Iowa Hospitals and Clinics provides comprehensive care for women with breast cancer, as well as other breast diseases. The team includes Breast Surgeons, Plastic Surgeons, Medical Oncologists, Radiation Therapists, Radiologists, Pathologists, Nurse Practitioners and Nurses. The care of each patient is individually tailored based on the treatment their particular problem requires. Some patients meet with only a few of the team members, while others meet with almost all of them, depending on each patient's needs and personal desires. Patients are discussed at a weekly Breast Tumor Board meeting attended by all Team members, and individual treatment plans involving all needed specialists are developed and coordinated. Breast reconstruction is considered for virtually all women who undergo mastectomies, as well as for those that require removal of substantial portions of a breast. Many reconstructive procedures are available, and each has pros and cons. Some methods of reconstruction are more suitable for some patients than others. All women requiring removal of all or the majority of a breast are offered the opportunity to talk to a Plastic Surgeon regarding available reconstructive options. The patient herself ultimately makes the decision as to whether or not she wants to undergo reconstruction. Though not all women who undergo mastectomy choose reconstructive surgery, many find that it improves their self-image and their ability to wear many types of clothing. If reconstruction is desired, most women choose to undergo their reconstructive procedure at the same time as their mastectomy. This option is generally available for most patients, though there may be circumstances where only delayed reconstruction is possible. Available techniques for breast reconstruction include breast implants, either with or without prior tissue expansion, DIEP (Deep Inferior Epigastric Perforator) flaps, TRAM (Transverse Rectus Abdominis Myocutaneous) flaps and latissimus dorsi flaps, as well as oncoplastic procedures. All of these procedures are offered at the University of Iowa Hospitals and Clinics. Breast implants have been used for breast reconstruction for many years, but there are currently many more options than existed in the past. There are now three types of implants available, and each comes in a variety of sizes and shapes. All of the implants have a silicone outer shell. The shells of the different types of implants are filled with either salt water, a more liquid silicone gel, or a more solid silicone gel with the consistency of ‘gummy bear’ candy. The implants filled with salt water feel more watery than natural breast tissue, but have the advantage that it is very evident if there is any problem with the implant. When damaged, the implant and reconstructed breast goes flat, and the body safely absorbs the salt water from the implant. With gel-filled implants, an MRI is often required to detect any problem with the implants. The gel generally stays within a scar capsule within the breasts if the implants rupture. The gel implants have the advantage, however, of feeling much more like natural breast tissue than the saline-filled implants. Published studies indicate that this type of implant provides women with a higher level of satisfaction with their reconstructed breasts. The more solid gel implants, or "form stable" implants, are the newest type of implant available. They have the advantage of contributing to a natural breast contour to a greater degree than the less defined gel- and saline-filled implants. Because of this characteristic, they are less commonly associated with ‘rippling’ type contour deformities, which occur when irregularities in the contour of the less-defined implants may be visible through the skin. Women considering breast reconstruction are shown the different types of implants and can choose the type they prefer. Another change in the way breast reconstruction is carried out with breast implants is the use of acellular dermal matrix. Acellular dermal matrix is skin taken from a human or animal and then processed, so that only the structural elements remain. All the cells and living elements are removed, so that it is acceptable to the body and can’t transmit any diseases. In the past, implants were generally placed under the pectoralis muscle alone on the chest wall. This muscle does not usually extend to the lowest part of the breast, leaving only very thin tissue for coverage of an implant in this part of the chest. Because of this, most surgeons felt uncomfortable placing anything other than very small implants at the time of mastectomy, and tissue expansion was used prior to implant placement in almost all patients. Now, acellular dermal matrix is sewn in place between the lower border of the pectoralis muscle and the lowest part of the breast to provide additional coverage and support to the implant. This allows the immediate placement of a much larger implant for reconstruction at the time of mastectomy. Many women have to have a significant amount of skin removed along with the breast tissue in order to treat their cancer, and for patients like this, there is often not enough skin left to cover an appropriately sized breast implant. Still other women have small breasts to start with and prefer that their reconstructed breasts are somewhat larger. In both circumstances, tissue expansion is often beneficial as a method of increasing the amount of skin available to cover a breast implant. Tissue expanders are similar to deflated breast implants, but with a valve incorporated into the implant shell. 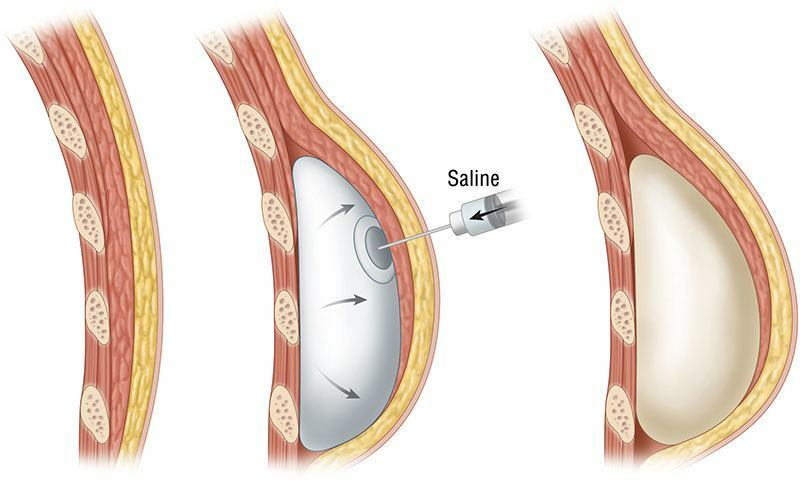 The valve can be accessed with a needle through the skin allowing the expander to be gradually filled with more and more salt water (saline). Expanders are usually inflated gradually, with additional salt water being added at weekly intervals in the outpatient clinic. As the expander is filled, the overlying skin stretches, just as a woman’s abdominal skin stretches during pregnancy. Tissue expansion is continued until the expander reaches, or slightly exceeds, the volume of the desired implant. Then, after providing some time for the skin to relax over the expander, the expander is replaced with a permanent breast implant, of the type the patient prefers, in a second surgical procedure. Though implants can often provide very natural appearing reconstructed breasts, they are not effective for everyone. Some breasts reconstructed with implants develop secondary problems such as firmness or an abnormal shape. Some patients, such as many who have undergone prior radiation therapy, are not good candidates for breast implants. Some patients simply prefer that their breasts be reconstructed with their own tissue. For patients requiring or desiring breast reconstruction with their own tissue, Deep Inferior Epigasteic Perforator flaps are commonly used. DIEP flaps are derived from the lower abdomen, where many women who have had children have excess skin and fat. This tissue is isolated on a single blood vessel derived from the groin area. Additional blood vessels are isolated in the chest area. These are usually the internal mammary vessels located under the ribs near the breastbone. The blood vessels of the abdominal flap are sewn to the blood vessels in the chest using a microscope to keep the abdominal tissues alive in their new location. The tissues are then contoured into a breast-like shape. Though DIEP flaps can often provide excellent reconstructed breasts, the surgical procedure is a lengthy one, a longer hospital stay is required, and additional incisions are required on the abdomen. However, trade-offs are worth the result for many women. The Transverse Rectus Abdominus Muscle is between the waist and the pubic bone. TRAM flaps utilize the same tissue from the lower abdomen that is used with DIEP flaps to reconstruct the breasts. The difference is that with TRAM flaps, the tissue is left attached to the rectus abdominis muscle in the central abdomen. The muscle is divided in the lower abdomen as the tissue is transferred under the skin of the lower chest to the breast area. A microscope is not required for this procedure. This procedure was more commonly used in the past, but has been replaced to a large degree by DIEP flaps. With TRAM flaps, there is more muscle weakness in the abdominal wall as compared to DIEP flaps, and problems with incomplete tissue survival are more common. The latissimus dorsi muscle is located in the upper back, and skin overlying the muscle can be transferred around the side of the chest to the breast area for breast reconstruction. Many do not have a great deal of extra skin and fat on their backs, and the transferred tissue needs to be supplemented with an implant to provide adequate breast volume. Because of this necessity, many prefer to use tissue expansion or an implant alone to avoid an extra scar on their back. For some patients, however, the skin of the chest may be insufficient due to prior surgery or radiation, and a latissimus dorsi flap can provide a good replacement for this compromised skin. For others with a larger amount of excess skin and fat on their upper backs, the flap can sometimes be used by itself to provide a very adequate breast reconstruction. For some patients, this can be preferable to the more involved procedures required for the transfer of tissue from the abdomen. Oncoplastic procedures are sometimes available after local cancer resections to provide a better shape to the breast. There are several types of oncoplastic procedures. One of the more common types is available to women with large breasts who might otherwise be candidates for reduction procedures. For these women, modifications of reduction mammoplasty techniques can be utilized to reshape the remaining breast tissue into a natural form. Such procedures are generally complemented by a reduction mammoplasty on the other breast. Another type of oncoplastic procedure for smaller breasts involves simply rearranging the remaining tissue to fill the defect created by the local resection (surgery site). This can often minimize the deformity that might otherwise be created by the lumpectomy. A third type of oncoplastic procedure consists of supplementation of the breast, generally with smaller local flaps than those described above, to replace some of the breast volume lost during a lumpectomy. Oncoplastic procedures are not necessary for all women undergoing lumpectomy and also aren’t always an option. However, such procedures can improve the aesthetic results after lumpectomies in selected patients. Other methods of breast reconstruction are occasionally used. These include transferring tissue from the thigh or buttock to the breast area. These procedures are involved and require the use of a microscope to attach blood vessels from the area where the tissues are taken to the blood vessels in the chest. Because the previously discussed procedures have advantages over these other methods in most patients, they are not commonly done, though they can be considered for women where other options may not be appropriate. Aesthetic Consultant's of Iowa provides plastic surgery for Breast Augmentation, Breast Reduction (male and female), Liposuction, Tummy Tuck, and more at our Iowa locations in Dubuque and Cedar Rapids. Contact us today for a consultation with a qualified Plastic Surgeon.